VV Brown’s second album opens with two songs that share Madonna titles but aren’t cover versions. “Substitute for Love” and “Nothing Really Matters” were two of the singles taken from the ultimate Madonna make-over album and mid-career return to form, 1998’s “Ray of Light”. Unhappy with the r’n’b follow up to “Bedtime Stories” (an r’n’b influenced collection itself), Madonna scrapped the entire sessions and hired electrohead, Brit, William Orbit, started calling herself Veronica Electronica and the rest is pop cultural history. Albeit on an entirely different scale, VV Brown has followed Madonna’s lead. About to release her follow up to the successful but underwhelming “Travelling at the Speed of Light” debut, Brown decided the hip hop and r’n’b-dominated follow up, a departure indeed from the nostalgic pop doo-wop of her debut, was not authentic and she walked away from the project and the album was never released. Two years on and as many career changes later she has returned with eleven angry, desolate and soulful songs set against a unsettling, uncompromising soundtrack and it is a startling reinvention indeed. 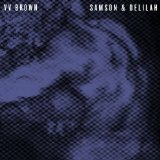 Samson & Delilah is released on VV Brown’s own YOY record label so it can assumed that this is what she wants to sound like now with little or no interference from outside parties, and that is remarkable. The aforementioned “Substitute For Love” opens in much the same way as the Madonna track opens “Ray of Light”, gently twinkling notes and ambient synths introduce Brown’s incredible voice which is now several tones lower; a contralto to rival Grace Jones and she sounds magnificent throughout. A dominant all-electronic backing that is somewhere between The Knife circa “Silent Shout” and Massive Attack at their most austere ( think “Sly”) with a mound of sticky dubstep coating the astounding, warrior-like, “Igneous”. It isn’t easy listening and the mood is pitch-black; a couple of songs like the title track can struggle to stand out when the melody is forsaken for a mood but these are minor niggles. “The Apple”, by some distance the most instant and accessible track here, sounds amazing. Its rolling, funking electro pop assertiveness is magical and Brown has huge fun with the relentless put-downs that lyrically dominate: ‘Don’t testify me, don’t bring me down, don’t hold me captive, you’re not the apple of my eye you see’. “Nothing Really Matter” is a swirling, sombre and sharp-edged synth monster which would have sounded at home on Adult’s last album, VV Brown never before having hinted at this unlikely and inspired direction. “Faith”, track eight of eleven, finally allows a chink of light to spill through and is more lifting sonically and melodically than anything preceding it. A duet with an uncredited male, it quietly references George Michael and with its theme of rebirth (‘I shake it off as I fall down to the ground, I belly flop into a swimming pool of sound, so you got to have faith’ ) and hope and a melody that will stick for days, it’s one of the strongest and most soulful songs here. “Ghosts”, in which Brown’s vocals spectacularly morph into 80’s singer songwriter Joan Armatrading, continues with similar themes and benefits from some simple but brilliantly constructed vocal effects over a droning organ and tight drum machines. The album ends with two tracks which bring to mind a singer/songwriter who is now an almost-cliched reference point for artists and music fans alike. I’m loath to point out the similarities in the songwriting between that of the haunting “Knife” and Kate Bush’s “This Woman’s Work” and the foggy, suffocating album closer “Beginning”, which sounds like a lost track from Bush’s “Ninth Wave” concept album which formed the second part of ‘Hounds of Love’. These aren’t parodies though, as is often the case, they are very well crafted compositions from an artist who may or may not be familiar with Bush’s work (I suspect the former) and to draw such genuine comparisons is a compliment indeed. “Samson & Delilah” never goes too far, gets too crazy or attention-seeking. The measured and meticulous tone and pacing of this album is a very large part of its success. VV Brown will have her work cut out for her when it comes to the initial promotion of this admittedly difficult album (for such a visual artist she has made the odd decision to hardly feature in the videos for the first two singles) and many will not make the connection between the Marks and Spencer model and former pop star and Brown’s current, definitive form. Twelve months down the line though, and many people will have hopefully been exposed to this album while having no idea who the artist is and it will become so something of a word-of-mouth slow burner. By any standards, this is a heartfelt and bold collection and a testament to VV Brown’s self belief.